This paper describes the scenario matrix architecture that underlies a framework for developing new scenarios for climate change research. The matrix architecture facilitates addressing key questions related to current climate research and policy-making: identifying the effectiveness of different adaptation and mitigation strategies (in terms of their costs, risks and other consequences) and the possible trade-offs and synergies. The two main axes of the matrix are: 1) the level of radiative forcing of the climate system (as characterised by the representative concentration pathways) and 2) a set of alternative plausible trajectories of future global development (described as shared socio-economic pathways). The matrix can be used to guide scenario development at different scales. It can also be used as a heuristic tool for classifying new and existing scenarios for assessment. Key elements of the architecture, in particular the shared socio-economic pathways and shared policy assumptions (devices for incorporating explicit mitigation and adaptation policies), are elaborated in other papers in this special issue. 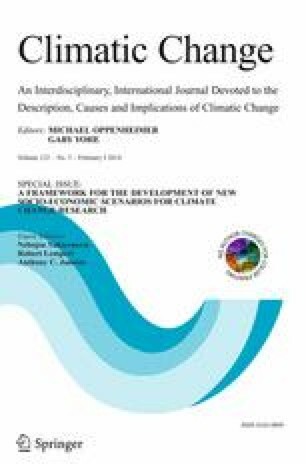 This article is part of the Special Issue on “A Framework for the Development of New Socio-economic Scenarios for Climate Change Research” edited by Nebojsa Nakicenovic, Robert Lempert, and Anthony Janetos. They allow for integration across research disciplines. Three key climate research communities are those involved in climate/earth system modeling (ESM) (understanding the natural in assessment of impacts, adaptation and vulnerability (IAV)) (understanding the risks and opportunities for human and natural systems presented by climate change and the possible adaptation policies to address) and integrated assessment modeling (IAM) (understanding the drivers of climate change and the effectiveness of potential mitigation policies). The interactions among these communities, such as the trade-offs between adaptation and mitigation responses, are relevant for climate research and policy. Shared scenarios can facilitate this, and, in fact, the process of scenario development itself could facilitate new, integrated, research questions. They make it easier to assess literature within and across research communities, as well as across studies at different scales and in different regions. Studies that share common assumptions about socio-economic trends and/or climate change outcomes are more comparable than those that do not, improving the ability to draw broader conclusions from the literature and to better support informed policy-and decision-making. They offer a valuable resource for researchers that are not able to, or prefer not to, generate scenarios themselves. For instance, not all researchers are interested in developing their own consistent description of future changes in demographics, economic development, changes in energy systems, land use and descriptions of social, cultural and institutional changes and policies, but might require such information for their analyses. Having access to community scenarios allow these researchers to focus on those areas where their research adds value. In 2006, a process was started to develop a new set of global ‘common’ scenarios (i.e. scenarios that are being developed to serve research needs across the relevant disciplines involved). The new scenarios were needed to address various issues such as the growing interest in mitigation scenarios, the need for more recent base year data and the specific data needs of state-of-the-art models (see also Ebi and Yohe 2013). The roadmap for the new scenario process was described in Moss et al. (2010). The process includes three phases. As the first step, the IAM community1 developed a set of concentration pathways (the Representative Concentration Pathways or RCPs) that were used by the ESM community to project the magnitude and extent of climate change (Taylor et al. 2012; Van Vuuren et al. 2011a). The emphasis in the second (current) phase, in parallel with the RCP-based climate projections, is to develop a set of new socioeconomic reference scenarios, with quantitative and qualitative elements, based on worlds with various levels of challenges to mitigation and adaptation. The current Special Issue forms part of this second phase. Moreover, new scenario storylines have been developed together with quantifications of associated population and income development which were reviewed by the research community in 2012. Articles describing these products are forthcoming (see Ebi et al. 2013). Finally, the socio-economic information, the RCPs and the associated climate change projections will be integrated in the third phase to develop scenarios for use by the climate change research community. Clearly, community scenarios will be used for very different purposes (discussed later), so a scenario framework should cater to the needs of the different communities, and guide the development and use of the new scenarios. Such a framework would not only be relevant for the research community, but also for key scenario users such as the Intergovernmental Panel on Climate Change (IPCC) and regional and national climate change assessments. This implies that the framework should not only be applicable at the global scale but also help link the many physical, socio-economic and decision processes that occur at different geographic and temporal scales. Second, the framework should not only focus on quantifiable (model) elements but also be relevant for social sciences, given their importance in the analysis of adaptation and mitigation options (see also Hackmann and Lera St. Clair 2012). Elements of an integrated framework were elaborated earlier by Van Vuuren et al. (2012b) and Kriegler et al. (2012). In subsequent activities, these elements were further elaborated and integrated into a unified and consistent framework. Here we report how this common framework extends the previous work, presenting a more coherent characterization of key scenario elements - such as shared socio-economic pathways, shared policy assumptions and the level of climate change - and the relationships between them. Some of these key elements are discussed in more detail in other papers in this Special Issue (O’Neill et al. this issue, Kriegler et al., Submitted for publication in this special issue). This paper is structured as follows. In Section 2, we describe the scenario framework in more detail. Section 3 discusses how the scenario framework can be used. Finally, in Section 4, we draw key conclusions. The trends in human development in relation to the drivers of climate change, the capacity to mitigate greenhouse gas emissions, and the vulnerability and capacity to adapt to climate change. Incorporate the RCPs. The RCPs were developed to explore climate change under different levels of forcing in the first step of the scenario development process. Therefore, a new framework should incorporate these pathways. Streamlined: The number of scenarios should be as small as possible. Comparable. The scenario set should facilitate comparison of different studies by providing common assumptions about climate outcomes and socio-economic developments. This will support the synthesis and assessment of results regarding climate change, impacts, adaptation and mitigation at multiple scales. Support uncertainty analysis. The framework should be capable of characterizing the range of uncertainty in the costs and other implications of mitigation, adaptation and impacts among alternative potential climate futures. Scalable. Scenarios should provide enough information at the scale of large world regions to support development of assumptions for studies at finer scales. Similarly, scenarios should include near- and long-term future conditions, the former providing links to ongoing trends and planning horizons and the latter including plausible large-scale divergences in key driving factors. Versatile. The scenario set should provide enough structure to facilitate consistency, and offer context and calibration points for IAV and mitigation analyses, but also offer flexibility for defining details relevant for sectors and regions in particular studies. Appropriate for social, institutional, governance and policy analysis. The framework should not only emphasize quantitative model-based analysis, but also be relevant for social science research. The two factors introduced in the previous section as organizing principles for the new framework (the level of climate change and socio-economic developments) determine to a large degree the ability to mitigate and/or adapt and the associated costs. Figure 1 shows how these sets of information are combined in the scenario matrix architecture. For the level of climate change, we propose to use related indicator i.e. the forcing level (see Section 2.3). This forcing axis is represented by the RCPs. The second axis of socio-economic assumptions are described in alternative future development pathways, called Shared Socio-economic Pathways (SSPs) (see Section 2.4). Next. scenarios can be defined for each cell in Fig. 1, where one level of anthropogenic forcing intersects with one set of socio-economic assumptions. It is worth clarifying the distinction between the terms scenario and pathway in the matrix architecture. We use the term scenario to describe a plausible, comprehensive, integrated and consistent description of how the future might unfold (Nakicenovic et al. 2000) while refraining from a concrete statement on probability. The term scenario specifically refers to integration of socio-economic, climate change, and climate change policy assumptions within the cells of the matrix. In contrast, the term pathway is used for the conditions describing the rows and columns of the matrix (e.g., the RCPs and SSPs). In other words, the term pathway emphasizes that these conditions are not comprehensive scenarios, but are focused on a specific component of the future (climate change or socio-economic circumstances). Only when combined can they provide the basis of an integrated scenario. The word pathway also emphasizes the time-dependent nature of the conditions. Radiative forcing forms a natural choice for one axis of the scenario matrix because it constitutes a major interface between the IAM (translating emissions drivers to forcing) and the ESM communities (translating forcing to climate change). In fact, the four RCPs were defined in terms of their radiative forcing in the year 2100 and trajectory of change (Van Vuuren et al. 2011a) (Table 1). The RCPs provide information that is an essential input to ESMs, including emissions of greenhouse gases and short-lived species specified on a 0.5° latitude × 0.5° longitude grid, as well as land use and land cover information. The ESM community is conducting multiple modeling experiments to investigate the climate response to the RCPs (Taylor et al. 2012). Due to uncertainty about climate change, there will be a range of climate outcomes (in terms of temperature, precipitation, extreme events, etc.) that can be related to individual RCPs (see also Section 2.6). It should be noted that in the RCPs, forcing refers to the global average forcing on the basis of greenhouse gases and air pollutants. At the local scale, forcing (and therefore climate change) can be very different due to spatial patterns of land-use change and air pollutant concentrations. The impacts of land-use change and air pollutants can, certainly at the local scale, be so substantial that they could potentially complicate the combination of climate model output based on a specific RCP and other scenarios with a similar global forcing level. It is still an open research question how important the possible inconsistencies introduced by different land-use and climate patterns are compared to other uncertainties such as regional climate change, the actual forcing of land-use change and air pollution or those resulting from the current implementation of land-use in earth-system models. The answer to this question determines how easily different IAM scenarios for a specific forcing level can be combined with existing RCPs. Potentially, scaling methods could be developed to somewhat adjust for differences in assumptions. The second axis of the framework is a set of socio-economic pathways consisting of quantitative and qualitative elements that describe the drivers of how the future might unfold in terms of population growth, governance efficiency, inequality across and within countries, socio-economic developments, institutional factors, technology change, and environmental conditions (see also O’Neill et al. 2013, who elaborate further on the SSPs). The SSPs are a small number of alternative characterizations of possible societal futures for use by different research communities, including narrative descriptions of future trends and quantitative information for some key elements. This information can be used as boundary conditions for the analysis of mitigation and adaptation policies. A key assumption in the proposed framework is that it is possible to combine the socio-economic pathways with different levels of radiative forcing. This feature of the approach is achieved by defining SSPs as “reference” pathways that would occur in a hypothetical case without new climate policy interventions (mitigation and adaptation) and without being influenced by future climate change (O’Neill et al. 2013). These reference pathways would then be combined with climate policy assumptions (including mitigation) in order to achieve forcing outcomes, and with climate change outcomes to create scenarios. In these scenarios, socio-economic development will be affected by both climate change and policy interventions and so will differ to some extent from the assumptions in the SSPs. The separation of climate policies and impacts from the SSPs is a methodological choice that facilitates the analytical use of the SSPs (see also Section 2.5 on the formulation of policy). Still, it should be noted that the SSPs are influenced by many other policy assumptions and environmental factors. The distinction between climate policies (not included in SSPs) and closely related policies such as energy policies (included in SSPs) is discussed in detail in Kriegler et al. (Submitted for publication in this special issue), but in general these are differentiated according to the primary intent of the policy. Scenarios associated with lower radiative forcing than in the reference case can be created by assuming mitigation policies sufficient to achieve the forcing outcomes, whose extent and consequences may depend on the nature of related policies assumed in the SSP. The degree of global climate mitigation stringency is inversely related to the level of radiative forcing in the year 2100: all else equal, the wider the gap between reference forcing and an RCP level, the more effort will be required to close it. Thus, by definition, for any given SSP, lower radiative forcing in 2100 implies greater mitigation stringency. Such considerations bring into sharp focus the importance of specifying policy scenarios in relation to reference scenarios based on the SSPs. A second key assumption in the framework is that different development pathways can lead to similar radiative forcing outcomes. In fact, the Special Report on Emission Scenarios (SRES) concluded that for each forcing level, multiple socio-economic scenarios could be identified (Nakicenovic et al. 2000). More recently, Van Vuuren et al. (2012b) observed that very little correlation exists between individual driver assumptions (such as population and economic assumptions) on the one hand and forcing levels on the other for climate policy scenarios reported in the literature (reconfirming the SRES finding). In order to fulfill the objective of the framework, the SSPs as a set should describe a wide range of different futures with different mitigation and adaptation challenges. The conceptual approach to ensure this is discussed in detail in O’Neill et al. (2013). This approach is directly organized around the level of future challenges with respect to mitigation and adaptation, forming a second matrix. Four key distinct storylines can be identified describing low and high ‘challenge’ combinations: SSP1 (low mitigation and adaptation challenges), SSP3 (high mitigation and adaptation challenges), SSP4 (low mitigation and high adaptation challenges) and SSP5 (high mitigation and low adaptation challenges). In addition, a fifth storyline is defined that has medium assumptions for both types of challenges. O’Neill et al. discuss how these positions in the ‘challenges’ matrix can be translated into basic assumptions for elements of the SSPs such as population, governance and technology development, but the content of the SSPs still needs to be elaborated further in subsequent work. Clearly, not every cell of the scenario matrix (Fig. 1) needs to be populated. For example, an SSP that is defined such that energy efficiency and the adoption of low carbon energy sources reduces the carbon intensity of economic production in the absence of climate policy, e.g. motivated by following a broader sustainable development agenda, may be inconsistent with radiative forcing reaching 8.5 W/m2 in 2100. As discussed in Sections 2.2 and 2.4, additional assumptions are needed about adaptation and mitigation policies to derive a scenario consistent with a given combination of a RCP and SSP (a cell in Fig. 1). First of all, this concerns the mitigation target. However, assumptions also need to be made on the policies: is mitigation achieved via an universal carbon tax or through various technology standards, when is it introduced and who participates in mitigation policies? Similarly, adaptation policies also need to be described (e.g., how much international support is available to help the poorest country adapt?) as well as the way in which these policies are implemented, including imperfections in policy design and enforcement (e.g., is mitigation implemented with full or partial participation of all countries? Is adaptation finance accessible to all countries?). As the effectiveness and costs of mitigation and adaptation will be very sensitive to the assumptions about climate policy, it is important to specify these clearly. Those policy factors can be seen as another dimension of the matrix architecture that characterizes the nature of the policy response (see Fig. 2) (for instance, in terms of participation, timing and international cooperation). While research teams will often make their own assumptions about climate policies, here, as for the SSPs, it is also useful to formulate a small number of shared (climate) policy assumptions (SPAs) that are common to different studies, hence improving the ability to compare scenarios across models and analyses. The concept of SPAs is discussed in detail in Kriegler et al. (Submitted for publication in this special issue). Because GDP and other variables could be affected by climate policies and by climate change impacts, the elaboration of scenarios that include one or both of these factors may well modify some of the SSP assumptions. Moreover, some SPAs are less likely for specific SSPs: for instance, it is not likely that all parties participate in international climate policy in a world that is characterized by fragmentation in other policy areas. The vertical axis in the scenario framework is defined in terms of RCPs, i.e. the level of radiative forcing. There are large uncertainties surrounding model projections of future climate for a given level of radiative forcing, due to factors such as the inherent unpredictability of natural climatic variations, global climate sensitivity in response to anthropogenic forcing and regional patterns of climate response (Christensen et al. 2007; Meehl et al. 2007; Tebaldi and Arblaster, Submitted for publication in this special issue; Van Vuuren et al. 2008). Regional projections of some climatic variables (such as precipitation and wind speed), which can be crucially important for impacts in certain sectors and systems, are even more uncertain than projections of others (such as air temperature). This is also true for the timing, pattern, frequency, duration, and intensity of weather events, which provides critical information for impacts assessments. Together, this implies that a specific climate model projection for a given RCP level might differ greatly from the projection from another climate model for the same forcing. This “climate change” uncertainty can be regarded as another axis of the framework (Fig. 3). It is important to address this uncertainty as much as possible by using a large range of ESM outputs (or pattern scaling results, see Tebaldi and Arblaster, Submitted for publication in this special issue). While analysts are increasingly applying multi-model ensemble climate projections in impact studies (e.g. Araújo and New, 2007; Diffenbaugh and Field, 2013), this is not always feasible. One way to handle the climate uncertainty while limiting the number of IAV calculations might be by identifying expected “best case” and “worst case” scenarios for specific purposes. For instance, if changes in precipitation are known to be a key determinant of agricultural impacts in a region, it is possible to identify, for a specific forcing level, climate models projecting the highest and lowest level of precipitation change in that region. Such methods are commonly applied in IAV analysis, although multiple criteria are normally applied in determining the final selection of representative climate scenarios to be used (IPCC-TGICA 2007; Wilby et al. 2009). Further guidelines on this would clearly be useful in application of the overall framework. The framework can be used in different ways, depending on the type of question being addressed. In this Section we provide some examples. Scenarios without climate policy (reference scenarios) based on different SSPs may produce different levels of radiative forcing and thus take different positions along the forcing axis. By design, the SSPs are not described in quantitative detail. This means that IAM teams can interpret a given SSP in different ways, creating a range of outcomes in terms of, for instance, energy, land use and forcing levels for a SSP. This range would provide a basis for exploring “baseline” uncertainty (Fig. 4). Mitigation studies may analyze how different forcing targets can be reached, given particular socio-economic circumstances (SSPs) across a range of models (going down a column, Fig. 5). IAV analysts could compare the impact and adaptation consequences of different degrees of climate change for a specific SSP (down a column: “how do the impacts of climate change and climate policy in a given future world vary under different assumptions of future radiative forcing”). By combining this information, a comprehensive characterization can be made of the costs and benefits of mitigation policies in relation to impacts and adaptation policy. IAV studies may also look into how the impacts of climate change and the options for adaptation vary for the same forcing level (RCP) across a range of socio-economic scenarios. The latter, by characterising aspects of vulnerability, can often be of key importance in determining the potential impacts of climate change (Fig. 5, looking along a row). Clearly, climate policy assumptions will affect some SSP elements. For instance, when looking at the effects of mitigation down a column (Fig. 5), several elements of the socio-economic assumptions will depart from the reference SSP (such as the characteristics of the energy system). Similarly, the effect of adaptation policies would adjust socio-economic conditions to ameliorate impacts. This is not portrayed directly in a figure, because the effects would often not alter the fundamental storyline of the SSP enough to move to another SSP. A comprehensive analysis covering all cells, would show how policy assumptions for mitigation and adaptation (SPAs) lead to changes in SSP elements, facilitating the calculation of adaptation costs, mitigation costs, and residual damages across the matrix. The scenario matrix architecture therefore facilitates the consistent evaluation of the costs of mitigation, adaptation, and residual climate damages. Climate policy assumptions play a key role here (Ebi and Yohe 2013). This topic is explored further by Kriegler et al. (Submitted for publication in this special issue). Figure 6 illustrates how costs associated with policy and impacts could vary across the matrix (depending on assumptions in SPAs regarding adaptation and mitigation). The colors do not suggest there will be a single value of costs for each matrix cell. In contrast, given uncertainties in cost estimates across different models, climate model uncertainty etc., there will be a range of outcomes for each cell. Still, the framework could be a basis to compare different studies, bridging different cells across the columns and rows of the matrix. In an analysis, it might be in interesting to include additional forcing levels between the RCP levels when these forcing levels are an important part of ongoing policy-making activities. The scenario matrix architecture can also be used as a heuristic tool and as a basis for new scenario development. Again, some examples are presented below. One important use of the matrix structure is as a heuristic tool, classifying typical published examples of combinations of factors that are crucial for adaptation and mitigation. By locating studies in different cells of the matrix, these studies can more readily be compared and evaluated. For example, let us assume that different studies have estimated the costs of mitigation policy for a wide range of different baselines. Such scenarios may include some with high technology development and global cooperation and others with slow technology development and little global cooperation. Classifying scenarios from the literature within the matrix might in that case allow researchers to account for these differences and thus compare scenarios with similar assumptions. Something similar was done in the IPCC Fourth Assessment Report, when scenarios were classified on the basis of resemblance to one of the SRES scenarios when accounting for costs (Fisher et al. 2007). This also could be done for impacts or adaptation studies: the SSPs and the matrix can help classify studies in a common way and provide a framework for communication across various communities. Obviously, using the framework as a heuristic tool requires that criteria be established to determine whether a scenario aligns with a specific SSP and/or with different forcing levels. It is possible to establish quantitative criteria that define a space around an SSP, as was done for the harmonized scenarios in the SRES (Nakicenovic et al. 2000). In that sense, it is also useful to use the earlier published quantifications of scenarios (Raskin et al. 2005; van Vuuren et al. 2012a) that identify scenario archetypes across assessments. The scenario framework is now already being used by different research teams that aim to further develop detailed narratives and specific quantifications of the SSPs. In this work, it should be noted that there is a clear trade-off between further specifying harmonization criteria (to increase the consistency in the literature) and providing flexibility (in order to allow for uncertainty). For community tools (such as the RCPs and SSPs), the latter aspect is very important to communicate uncertainty, to allow for different approaches, to avoid constraints on research directions, and to provide an opportunity for wide participation of the research community in scenario analysis. In this context, a scenario development process might include both a wide range of scenarios for each matrix cell, but also identify specific “marker” scenarios that illustrate distinctive scenario types within the framework (similar to what was done for SRES). Caution needs to be exercised to ensure that the streamlining achieved by identifying marker scenarios does not compromise the treatment of key uncertainties. While the scenario matrix architecture exhibits numerous strengths, as outlined above, there are also several limitations to the approach that may present challenges to analysts. The architecture can be difficult to communicate. Previous global scenarios often simplified the scenario space by focusing on a specific topic (e.g. development of emissions in the absence of climate policy such as SRES) or by assuming relationships among key variables (e.g. in scenarios developed for the Millennium Ecosystem Assessment (MEA, 2005)). This framing promoted the identification of only a handful of ‘marker’ scenarios. The current architecture, in contrast, aims to provide a comprehensive description of the scenario space for future climate policy. Without further selection, this also leads to a more complex framework that might not always be easy to communicate. Experience, however, has shown that the difficulties in communication can be reduced by a clear explanation of underlying elements. Introduction of community scenarios could lead to a reduction of tailor-made scenarios. In that context, it should be noted that the development of these community scenarios is a time-consuming process. It is clear, however, that specific, tailor-made, scenarios are also needed to answer particular research questions. Definitional issues. Connecting IAM, climate modeling and IAV research communities implies that terminology from each of these communities will be used. This may sometimes lead to confusion. However, increased cooperation could lead to a more consistent use of different terms. The SSPs have been defined to serve the needs for climate change research. Experience in the past has shown that such scenarios have a much broader reach into the wider global environmental change and sustainability literature. It is currently still an open question whether the SSPs can also be broadened in this context (see further O’Neill et al. 2013). In this paper, we have described a framework for developing community scenarios for use in climate change research and assessment. The framework focuses on some fundamental research questions: the identification of costs, risks and benefits associated with mitigation and adaptation policy and the trade-offs and synergies between different strategies. The framework has two main axes: 1) some fundamental research questions (as characterised by the RCPs); and 2) different socio-economic pathways (as described in the SSPs). Both pathways are described in the absence of climate policy (e.g. policy instruments and participation rules). These can be combined with climate policy assumptions as well as other uncertainties (such as climate change projections) within a scenario matrix, to create integrated scenarios. The framework can be used to investigate a number of diverse climate research questions. Comparison of scenarios down the columns of the matrix can help to evaluate the costs and benefits of mitigation and adaptation policies for a given pathway of future socio-economic development. Comparison across the rows of the matrix can provide insights on how different socio-economic conditions may influence climate impacts and policies. The scenario framework can also be used as a heuristic tool for classifying new scenarios and existing scenarios and studies, and as guide for developing new scenarios. Currently, research teams with expertise in scenario drivers, integrated assessment modeling and IAV research are developing these new scenarios. Scenarios have served as an important crystallizing function in climate change research in the past, and will likely continue to do so in the future. The framework presented here is intended to provide a further step towards integration across the different communities engaged in climate change research. It should be noted that a wide range of different integrated assessment models (IAMs) exists, ranging from models with a strong focus on the economic or energy system to models with a much more elaborate representation of the earth system (for instance, including land use). The models involved in designing the representative concentration pathways (RCPs) and Shared socio-economic pathways (SSPs) are mostly examples of the second category.